"Clausewitz summed up what it had all been about in his classic On War. Men could not reduce strategy to a formula. Detailed planning necessarily failed, due to the inevitable frictions encountered: chance events, imperfections in execution, and the independent will of the opposition. Instead, the human elements were paramount: leadership, morale, and the almost instinctive savvy of the best generals.... The Prussian general staff, under the elder von Moltke, perfected these concepts in practice. They did not expect a plan of operations to survive beyond the first contact with the enemy. They set only the broadest of objectives and emphasised seizing unforeseen opportunities as they arose. Strategy was not a lengthy action plan. It was the evolution of a central idea through continually changing circumstances." Think about strategy and sharpen your judgment in an unpredictable environment. "Writers who use war as a metaphor for business have always been less than appealing to me. Maybe it's because, as some folks say, "It's a 'guy' thing," and I'm not a guy. 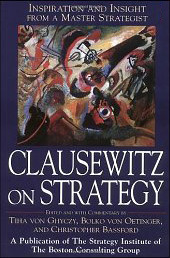 On the other hand, I had trouble putting down Clausewitz on Strategy (Wiley, 2001), a publication of the Boston Consulting Group's Strategy Institute and edited by Tiha von Ghyczy, Bolko von Oetinger, and Christopher Bassford. In their carefully chosen selections from Clausewitz's On War and in their lengthy commentary in the introduction, these present-day strategists present much food for thought." "Like many who are interested in strategy, I have attempted to read his classic book, On War. I found it to be hard going, and of limited benefit to my interest in business strategy. 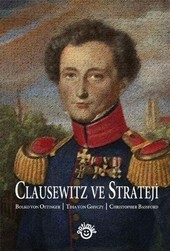 Clausewitz on Strategy is an extremely well-done book that takes the key points of On War, polishes them until they shine brightly, sets them amid many commentaries that elaborate on the same points, and uses a thoughtful introduction to connect the ideas to business strategy. The book's structure reminded me of a fine necklace, with the major gem stones set amidst complementary smaller gems. For me, this was the perfect approach, and I liked the book very much." THE BOSTON CONSULTING GROUP is one of the world's leading management consulting firms. Its clients include many of the world's industry leaders. CHRISTOPHER BASSFORDis a former US Army artillery officer. Long Professor of Strategy at the National War College in Washington, DC, he now teaches at JSOMA, part of the Special Warfare Center at Fort Bragg. He is webmaster of The Clausewitz Homepage, and the author of several books, including Clausewitz in English: The Reception of Clausewitz in Britain and America (New York: Oxford University Press, 1994). While many writers say quite bluntly that "business is war," The Clausewitz Homepage takes the position that business is NOT war—not even metaphorically speaking. It's true that politics, business, and war belong to the same broad class of phenomena, and that there are events within business that correspond in significant ways to war. Indeed, wars have actually been waged at times by commercial corporations (think of the Hanseatic League or the East India Company) for essentially commercial objectives. For that matter, there have always been mercenary armies, which are essentially businesses that sell their military capabilities. But these are very specific instances of business and war occupying the same space at the same time. In general, just as war is a particular manifestation or subset of politics, business analogs to war are subsets of a larger phenomenon—thus, business as a whole is properly compared to politics, not war. We hear increasingly that "strategy" is irrelevant and that all we really need is better execution. I'm pretty sympathetic to the frustrations underlying that view, but the author of The Art of Action understands that strategy and execution are not separate domains. Stephen Bungay, who enjoys real credibility as a businessman (including 17 years with The Boston Consulting Group) and as a military historian (graduate work at Oxford and Tübingen) demonstrates a sophisticated grasp both of Clausewitz and Moltke's thinking and of how that thinking was reflected in practice by the German General Staff. Crucially, and unusually for writers who attempt to map the military domain to business, he genuinely understands that "business is not war." This is a business-oriented site devoted to promoting the ideas of air-combat theorist John Boyd, inventor of the famous (and very useful) OODA Loop. Boyd's pretty interesting, but too many of his acoltes fee that his disciples are obligated to attack Clausewitz—for no evident reason. by Fast Company. Business in the New Economy is a civilized version of war. Companies, not countries, are battlefield rivals. "Changing the Game: Least-Cost Planning for Competition and the Environment," by Mark E. Krebs. "The bulk of the chapter relates electric utility marketing programs (including DSM, IRP and economic development) to the nine principles of warfare originated by General von Clausewitz in the early 19th century and Sun Tsu's "The Art of War," written 25 centuries ago." Our approach to the development of strategic management software is influenced by ancient theories developed by army generals like Sun Tzu and Von Clausewitz, but put into practice with the latest technology development. (HHMI) http://www.hartwickinstitute.org/ This link has disappeared.